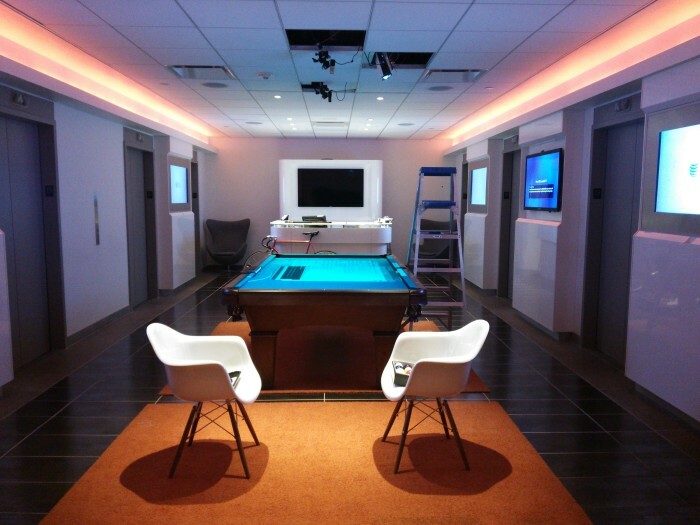 Hi, today I visited AT&T AdWorks Lab in New York to set their Openpool up. 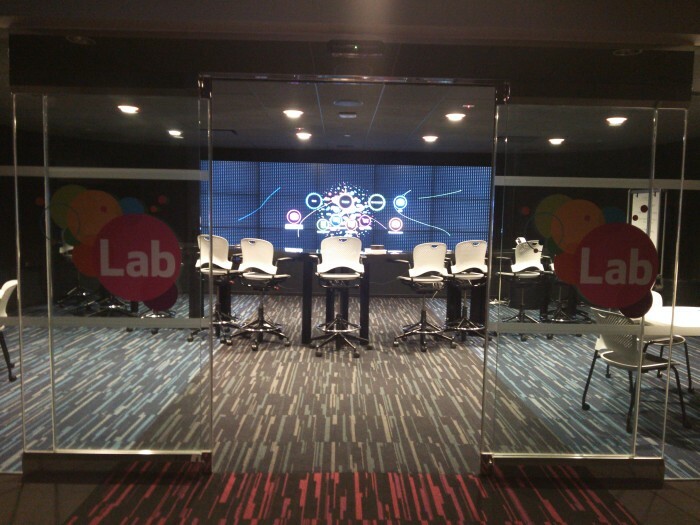 Where do you think the Openpool is installed in AT&T AdWorks Lab? That’s the center of the entrance space!!! They are actually going to exhibit the Openpool in the upcoming Advertising Week, “the world’s premier annual gathering of marketing and communications leaders each year in New York City” (quoted from the official website), which is a great honor for us Openpool team. 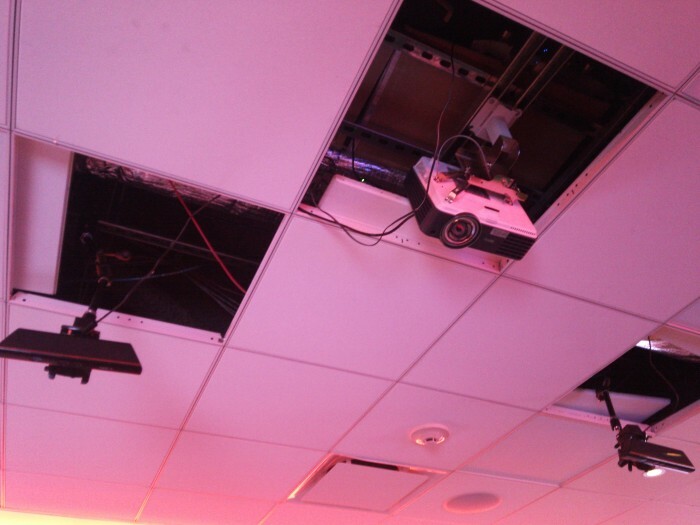 In the AT&T AdWorks Lab, Kinects and a projector for Openpool are installed on the ceiling. 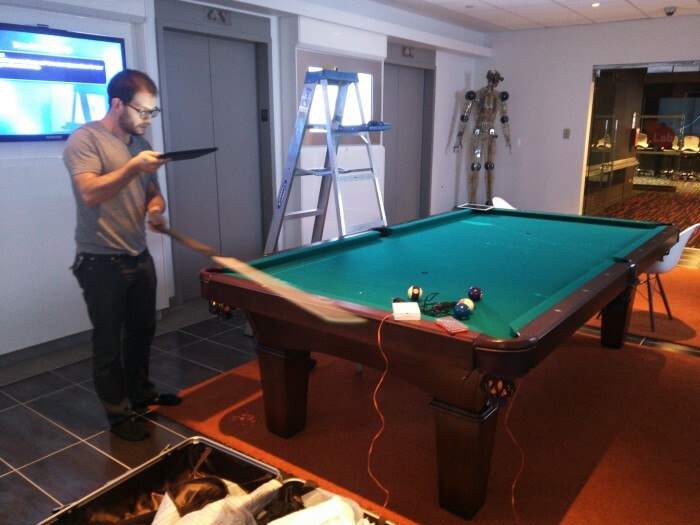 We tackled calibrations and on-site problem solving with Alex, a nice guy working for AT&T and in charge of exhibiting the Openpool. The Openpool team in Japan also joined this session remotely. In the photo above, we leveraged such great remote working tools, mainly Hangout and some desktop sharing tool, that Alex was moving a cue back and forth and sending the real time video to the team in Japan and the team was simultaneously calibrating the images and sensors by remotely operating the PC at the AT&T Adworks Lab. It sounds too complicated but works excellently! We finally finished the calibrations (while it was not a easy way… it took over 2 hours to solve some physical restrictions) and also made sure that the Pocket Detector works while it was another challenge for us to install the Pocket Detector to this “basket style” pocket because most of pools in Japan adopt “rail style” pockets and we have only worked on those. We finally found a way to install the Pocket Detector and made sure it works. However, unfortunately AT&T Adworks Lab had no AC power plug on the ground around the Openpool, which is necessary for the Pocket Detector. We just tested it works and gave up completing the installation of the Pocket Detector today as that is just an add-on and Openpool works without that. 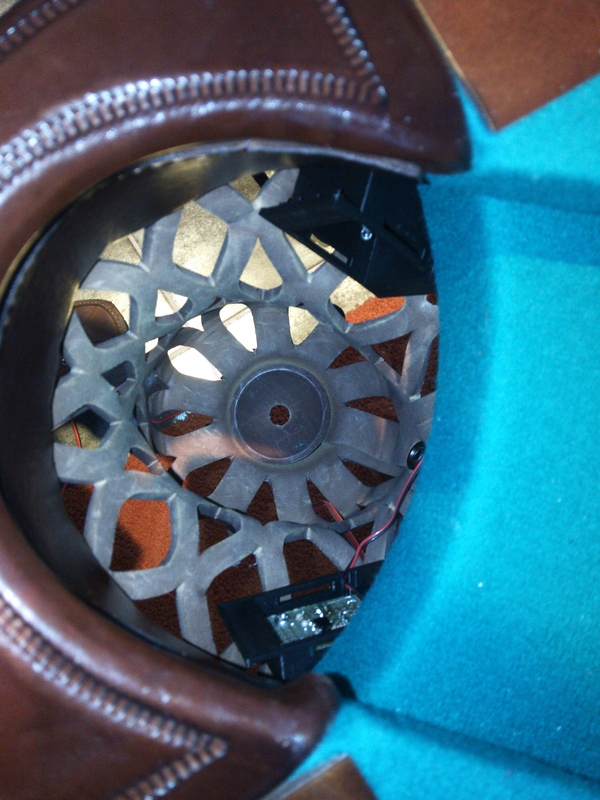 I will develop a battery-powered version of the Pocket Detector and come back here to install it. Besides the Openpool, needless to say, AT&T AdWorks is such a cool place to visit. There’s a cool exhibition space, everything in which is controlled remotely and works interactively. When you walk from the entrance to the exhibition room, effects on the wall follow you. I cannot wait for the Advertising Week from Sep 23 to 27! Now the Openpool at AT&T AdWorks Lab is working with its base package, and is going to have an add-on of the Pocket Detector soon!